Greek oregano, unlike Mexican oregano, is a member of the mint family. Its flavor is decidedly different, milder and more floral. It’s also rich in phenolic compounds and flavonoids which may account for its potent antimicrobial and antioxidant activity. Moreover, preliminary research indicates that oregano may have an anti-proliferative effect on human breast cancer cells1, 2. It’s the potent essential oils of oregano that offer the most strongly medicinal effects. Indeed, oregano essential oil can be a potent tool in the control of food-borne pathogens like listeria3 and salmonella4. You can learn more about the medicinal properties of common culinary plants here. Lamb, too, can be powerfully nutritive and we eat it frequently. Grass-fed lamb arrives in our meat CSA periodically, and we also purchase a small whole lamb every autumn when local ranchers begin their harvest just before the snow sets in for winter. Grass-fed lamb, like beef, can be a rich source of conjugated linoleic acid – a fatty acid known for its strongly anti-carcinogenic properties5-7. And while certain methods of cooking meat, such as grilling or blackening may increase the carcinogenic components of the food, it’s important to note that meat itself contains components that are critical in protecting against cancer such as selenium, B vitamins and CLA8 – it’s all about how you source and cook the meat. Grass-fed red meat is considerably richer in these anticarcinogenic components than conventional, grain-fed meat – particularly CLA, omega-3 fatty acids, antioxidants and the vitamins A and E9. Grass-fed butterfat is particularly rich in CLA making ghee or clarified butter one of the most potent sources available of this vitally wholesome fat. Lamb is also a rich source of trace minerals including zinc which is critical to healthy reproduction, cognitive function and a well-functioning immune system. Indeed, a 3-ounce portion of lamb contains roughly one-third of the body’s daily requirement for this mineral10. 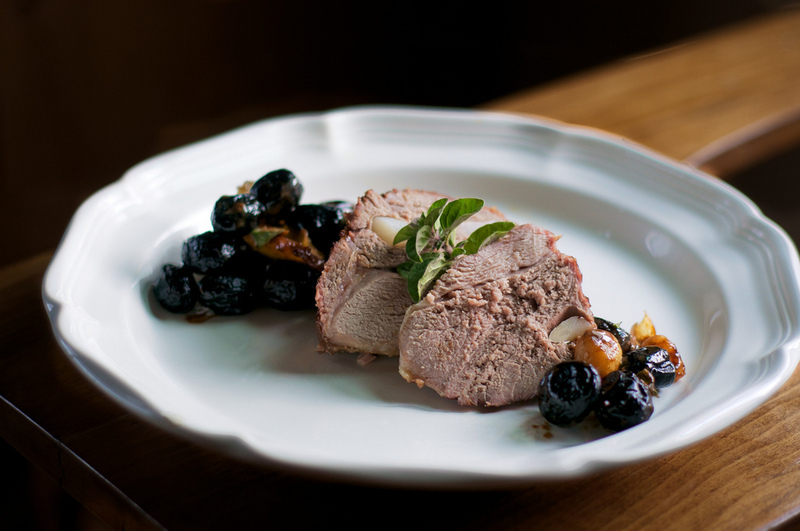 Like most dishes of roast meat, roast lamb with olives, lemon and oregano is extraordinarily easy to prepare. 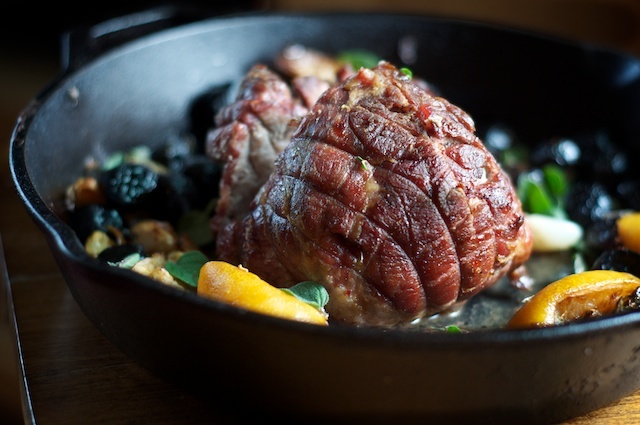 The lamb is first seared in ghee or clarified butter before deeply aromatic additions of sun-dried olives, preserved lemon, whole garlic cloves and Greek oregano are tossed into the hot skillet, then it is slow-roasted for several hours to ensure tenderness and flavor. Minimize dishes by serving the roast lamb in the skillet in which it was baked. Preheat the oven to 275-degrees Fahrenheit. Truss and tie the lamb roast with 100% cotton cooking twine to ensure even cooking an attractive appearance. Pierce the lamb roast, inserting about half the garlic cloves into the roast. Reserve the remaining cloves for the skillet. Heat about two tablespoons clarified butter in a cast iron skillet over a medium-high flame until it melts. Add the trussed and tied lamb roast to the hot fat, searing on each side for about 1 minute or so. Reduce the heat to medium and add the sun-dried olives, quartered preserved lemon, remaining garlic cloves and about half the fresh oregano to the skillet. Allow this mixture to cook with the lamb, stirring as needed, for about two minutes. Pour about 1 cup of red or white wine or chicken stock, to the skillet. Remove from the heat and place the skillet in an oven preheated to 275 degrees Fahrenheit. Roast for about two to three hours, depending on the roast’s size. Serve in the skillet, sprinkled with remaining fresh oregano. This looks soooo good. Having just returned from a trip to Greece, foodwise I am presently totally in love with all things Greek. While I was there I loved buying big bunches of the wild oregano and using it in all sorts of things – I am really missing it. I only just stumbled across your blog by the way – I love it and will definitely return. My lamb has a netting around it, it doesn’t say anything about removing it unless it’s going on a BBQ, but should I replace it with kitchen twine (in my case it would be 100% cotton yarn since that’s what I have) just to be safe? If it comes with a net, I leave it on rather than retrussing. I’m lazy like that. I made this tonight and it was incredible. I didn’t know whether to cover or not, so I didn’t. I also didn’t have preserved lemons so I used regular, and I clarified the butter when I melted it. I just had regular oregano, as well. It was a knockout. Thank you for sharing this!